It takes courage to be an elephant seal pup. 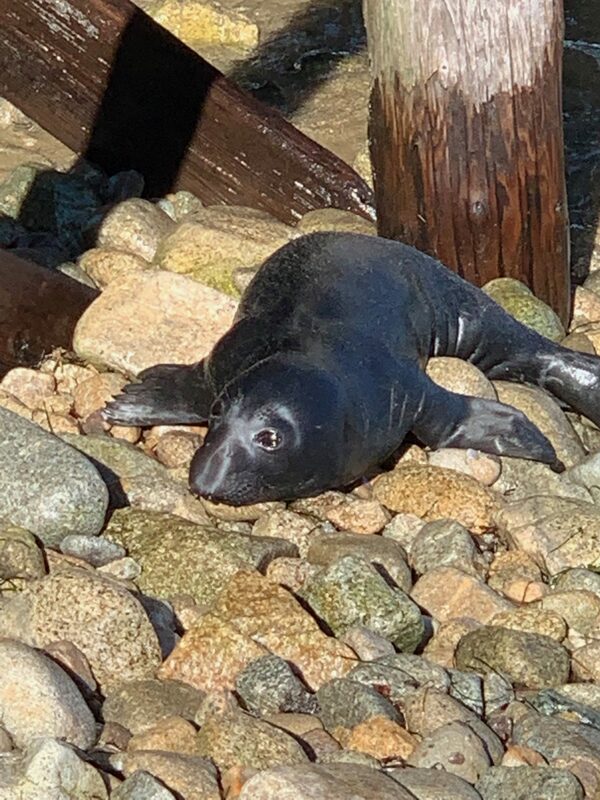 Born on a winter beach surrounded by mating 1000-4000 pound elephant seals, king tides, storms, competition for food…it’s a fight to survive. At Point Reyes National Seashore, this pup was separated from the herd. The pup was fighting to get out of the rising tide and crying as loud as possible. Eventually, a female seal circled around and became watchful. The pup’s courage to fight was impressive despite the shivers and cries. I was not sure if the pup would make it through the very high tide but somehow that determination in his/her eyes made me think…this little one’s got courage. Anthropromophism aside, courage is a topic worth pondering. What gives you courage when you are in rough seas? Many of us have anchoring words of courage. What are yours? One of my favorite books on leadership is actually a book about courage. Leading From Within: Poetry that Sustains the Courage.This book is a collection of 93 poems from well-loved poets, each of which is accompanied by a brief personal commentary from a leader explaining the significance and meaning of the poem in his or her life and work. Each leader, from kids softball coaches to President’s of universities, gives an example of how their poem or quote have given them courage them throughout life. I think about this collection of poems as anchors for leaders. When you need courage…what quote, book, poem anchors you? Perhaps you have a quote on your desk that you turn to for moments of inspiration. This week, take a look at some quotes about courage and pick one that will anchor you. Pick a poem or quote and then notice how your anchoring words of courage are helping you to take action, make tough decisions, pursue dreams, and find ways to thrive. Many people have referenced the poet Mary Oliver this week as her poems have anchored and encouraged so many of us. Her Summer Day poem…” tell me, what is it you plan to do with your one wild and precious life?” is certainly an example of an anchor to be courageous. Enjoy finding your anchor words of courage. What words inspire you to be courageous? I’d love to hear about your poem or quote.